Hmm. Everybody seems to be reading literature except for me. Classic stories with titles I recognize from AP booklists. Yeah, well, you won't find me showing that kind of sophistication. Take Interesting Times, for example. Terry Pratchett is a well-known author (see introduction here) with a huge number of books to his credit, but his stories tend to be very satirical, silly, and not like serious literature at all. 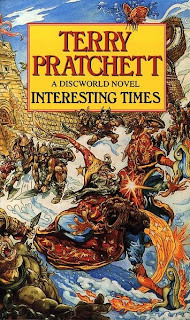 Interesting Times is the 17th of 36 books currently in the Discworld series. The title comes from an ancient curse: "May you live in interesting times." It was a fun and diverting read, just as I have come to expect from Pratchett. But not advanced reading, by any stretch. The hero of the story (well, main character at least) is Rincewind, a hapless "wizzard" who seemingly has no control over his destiny. From the start, he is whisked to and fro by magic, winding up on the Counterweight Continent (a parody of the orient, particularly China). There, the emperor is dying and the typical fighting for succession is taking place among the nobility. At the same time, a very weak rebellion is building, inspired by the writings of a former companion of Rincewind's from a previous book. Though Rincewind would love to turn tail and live to run away another day, that proves to be beyond his capabilities. Instead, he is reluctantly dragged through one hazard after another, surviving due to some extraordinary luck, which unfortunately for him doesn't seem to benefit him in any other way, except continued survival. There are countless quirky characters that interact with Rincewind. The plot moves along quickly enough, and the characters are interesting if not loveable in their unique ways. For a comedy, the author shows some interesting perspectives on things and will make you think occasionally. On the downside, many of the jokes occur over and over, until you dread reading them again. By the end, the aargh joke, the age of the barbarians, and Rincewind's cowardice were getting annoying. And there are a lot of puns of dubious quality. But I'm patient, and I was satisfied with the read. I don't consider Interesting Times to be Pratchett's best novel, but it was exactly what I was looking for: something light and whimsical, with no promises of sophistication to scare away the slacker within me. I think in a series, there are certain things that are bound to become tiresome after awhile, that maybe the author him- or herself are not even aware of, especially with regards to repetitious. There's a certain need for repetition cross-book, and sometimes it ends up within a book as well (Harry Potter 4, for example, is really bad about that). Not that everything you discuss here can be attributed to that. Have you read all of the ones prior to this one, then? Yeah, well, I thought of excluding November Ever After, but I didn't bother. I haven't read them in order; I've read around 10 of the books, but they stand alone pretty well, while adding to the overall story of the Discworld. Some of the books focus on Rincewind, some on the witches, some on the wizards, and some introduce new characters altogether. You probably don't want to know this in depth, but if you go here there is a really useful chart 1/3 of the way down the page. But there are so many of them (and no order really given in the front of the books to help) that I just pick ones that look interesting (I enjoy the books about the witches, typically). The quote "May you live in interesting times" has been used in many of the books, so I thought it would be an important one to try out. But, as I said, I've enjoyed some of his other books much more. Two of them (Wee Free Men; The Amazing Maurice and His Educated Rodents - both in his Young Adult category) in particular seemed like great books. I'm sure there are many others that are great which I haven't come across yet.